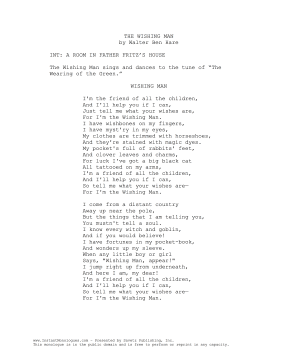 Walter Ben Hare's play "The Wishing Man" features a song perfect for male musical auditions. The Wishing Man sings and dances to the tune of "The Wearing of the Green." For I'm the Wishing Man. And they're stained with magic dyes. You mustn't tell a soul. And if you would believe! And wonders up my sleeve. And here I am, my dear!